Basketball is on my mind at the moment, with the NBA Finals about to commence (Go Spurs!) and my knees still aching from a basketball outing almost two weeks ago (Oh nature, she is so sweet; she does not usher us out of the gene-pool all at once, but rather gradually and with the illusion of grace.). With that in mind I poked through the archives from my trip last year, found this photo and thought I should write. I took this photo last September in Novi Sad — a smallish town a bit outside Belgrade, Serbia that was devastated during the 1999 NATO bombings and where some of my recently rediscovered, extended family lives today. 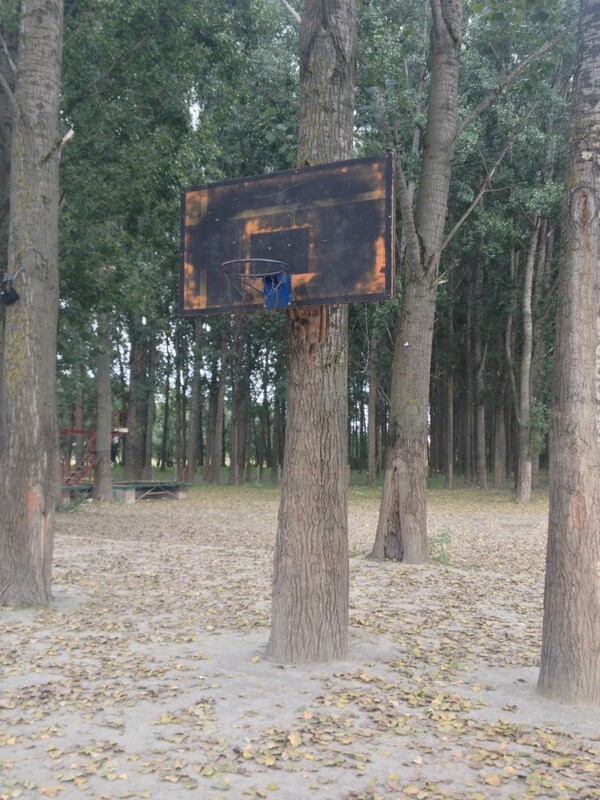 This court — really not much more than a level span of dirt covered with leaves and this homemade backboard nailed to a tree — was in a small clearing right along the Danube river. Serbia has a very proud basketball tradition, though it might be more accurate to say some of it belonged to Yugoslavia, and by extension Croatia. Vlade Divac. Drazen Petrovic. Toni Kukoc. Dino Rada. Peja Stojakovic. It's a confusing situation to understand from the outside. "Croats, Serbs, Bosnians — we're all the same people. We just... don't like each other very much!" was how it was summarized for me during my stay. There is a wonderful documentary by ESPN 30 for 30 called Once Brothers that touches on all of this. In it they follow Vlade Divac around as he revisits the town he grew up — about 4 hours outside Belgrade — and talks about his experiences with the Yugoslavian national team of the late eighties; a legendary team composed Serbs & Croats. Specifically they focus on his relationship with Drazen — an up-and-coming international talent whose life was cut tragically short. It's worth a watch if any of those topics interest you. For me, now, I'm surprised how much the intro of Vlade revisiting his hometown and sitting with his parents for a meal reminds me of my brief time in Serbia. The look and feel of the buildings; the never-ending-supply of meats being offered; the little doilies on the kitchen table and the thin coat of post-soviet malaise that seemed to touch everything, aesthetically... It's hard to explain.